Affinaquest is a full-featured customer relationship management (CRM) system built specifically for nonprofit organizations. Affinaquest is a Salesforce Foundation partner, and the solution is built on top of the traditional Salesforce.com platform. Its goal is to provide all of the functionality of Salesforce at a price that nonprofit organizations can afford. Affinaquest can be used by organizations of any size, and offers a comprehensive solution for donor management, data collection, and analytics reporting. This web-based software was designed by fundraising veterans, with nonprofit needs specifically in mind. The constituent demographic tracking feature allows organization to view visual breakdowns of their donor base that is segmented by employment, address, community interests, relationship status or more. This allows for precise marketing, and more effective communication efforts. 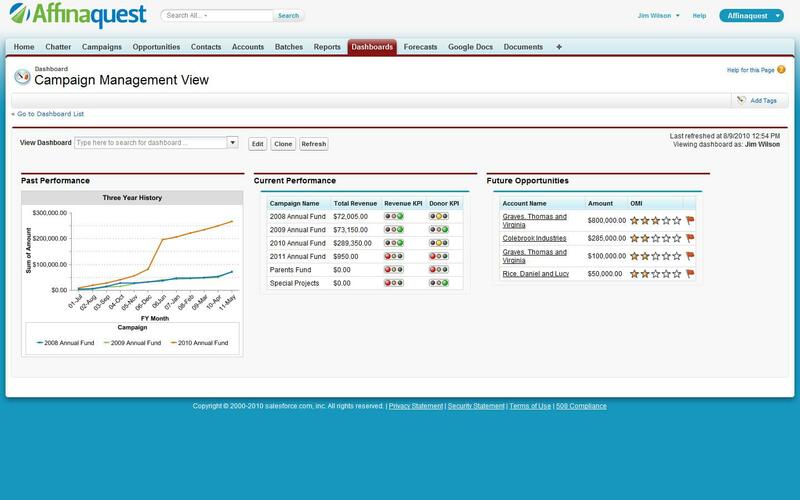 Affinaquest also includes gift and pledge management features, prospect tracking, and campaign forecasting. There are numerous security features included such as user authentication through Salesforce.com, individual user profiles, audit histories, and individual user roles with defined privileges. Affinquest automatically integrates with programs such as Outlook, Microsoft Office, Google Apps and more. Nonprofit organizations often need to collect, organize, and track large amounts of relationship data regarding their constituent groups, donors, and campaigns. However, due to the specialized data requirements and smaller budgets of most nonprofit organizations, they are left with few viable CRM options. Affinaquest is designed to remedy this situation by providing the power and functionality of the Salesforce.com platform at a price nonprofits can afford, and with tools specifically tailored for their needs. Learn everything you need to know about Affinaquest. Our experts will reach out to you shortly.